If the first books and movies weren’t enough to make anyone a Harry Potter nerd, now the new era of Fantastic Beasts has arrived and it is nothing short of spectacular. If you haven’t made it to the theater yet, seriously run, don’t walk. It is amazing. I’m working on going a second time, it’s THAT good. 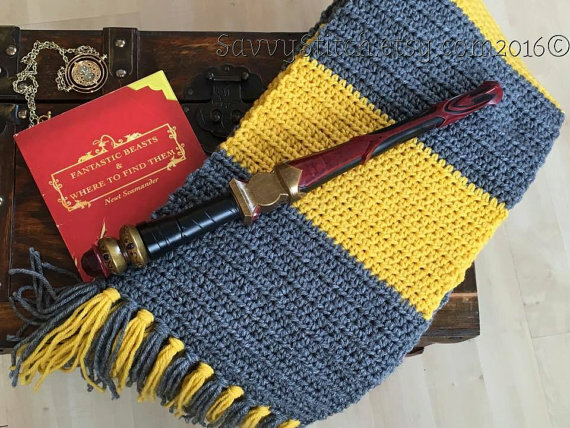 If you have a Harry Potter fan in your house look no further for gift ideas than this fun round up of gift ideas from our affiliate, Etsy. 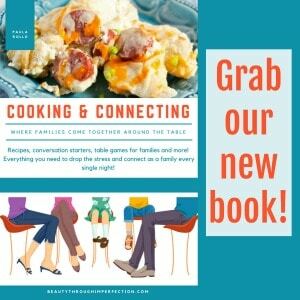 For more gifts in different categories you can check out in the editor’s picks section of their site. 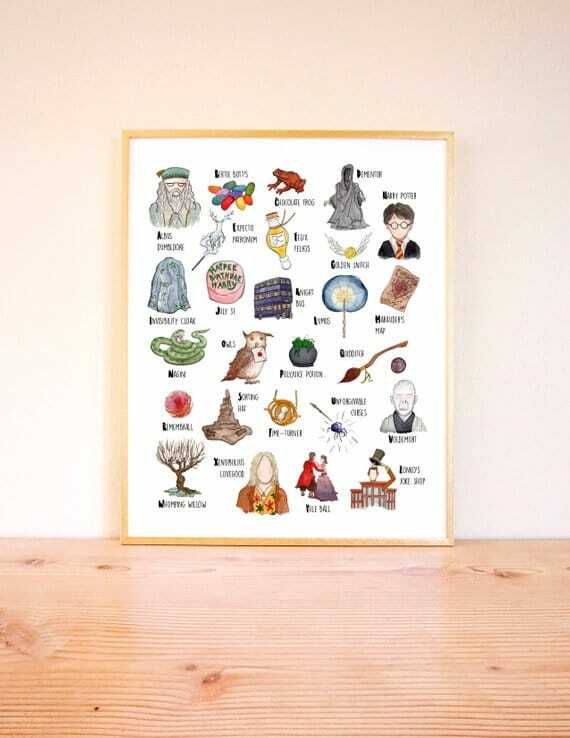 I am so in love with this Harry Potter alphabet chart done in water colors. The owner on the etsy shop sent me one of these prints and it’s positively gorgeous in person! Get yours here. 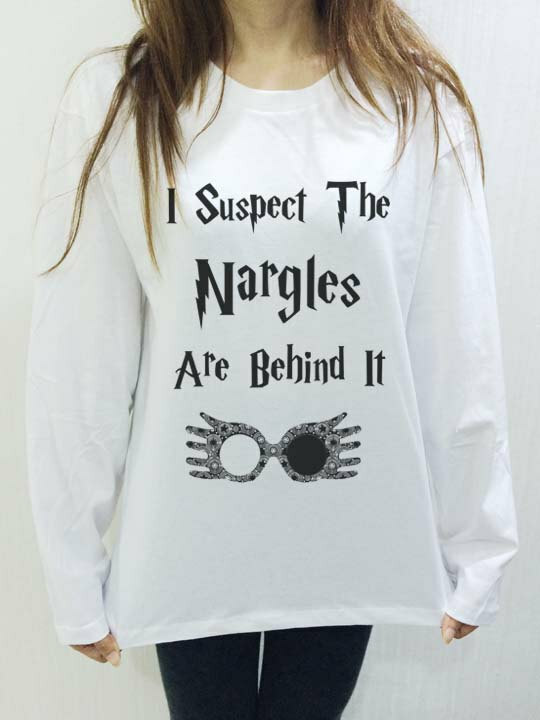 Luna/Nargles shirt – Luna is one of the most beautiful characters in the books. She’s quirky, unique and confident. She knows her quirks keep her from having friends but it doesn’t stop her from BEING a good friend or turn her bitter against the other kids. She’s patient, loving and kind and an amazing role model for all her quirks. She may blame odd things on imaginary Nargles, but that’s one of the reasons we love her! 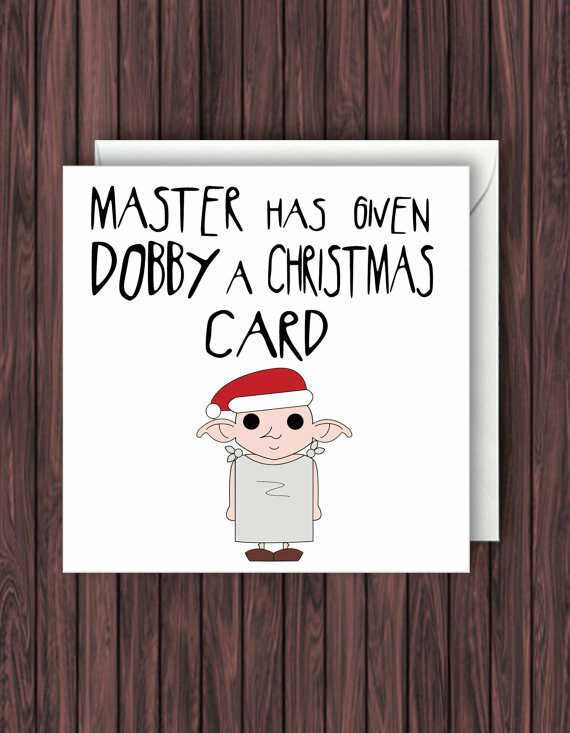 Dobby Christmas card – We know Dobby was thrilled with anything from Harry Potter, even a dirty sock, but can you imagine if Harry ever got the chance to give him a card? 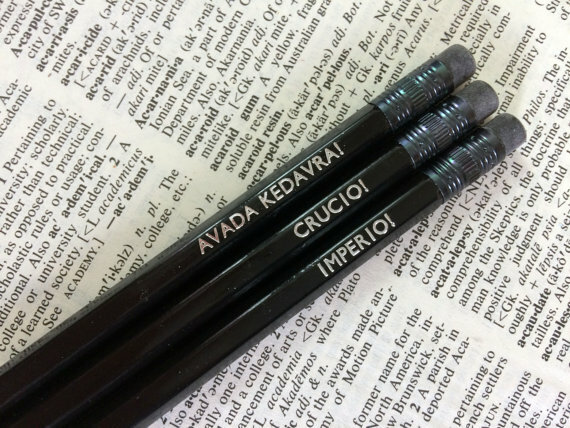 Unforgiveable pencils – For the darker witches and wizards in your life, gift them these pencils to help them remember the unforgiveable curses. 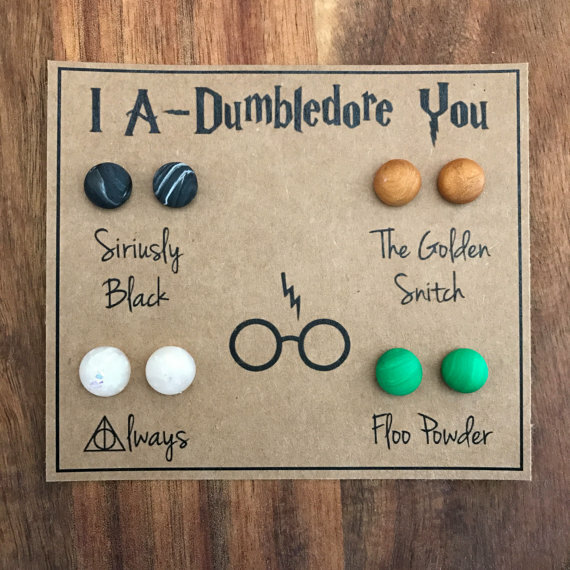 Harry Potter inspired earrings – These colors are gorgeous and it’s a subtle way to show your love for the Harry Potter world. 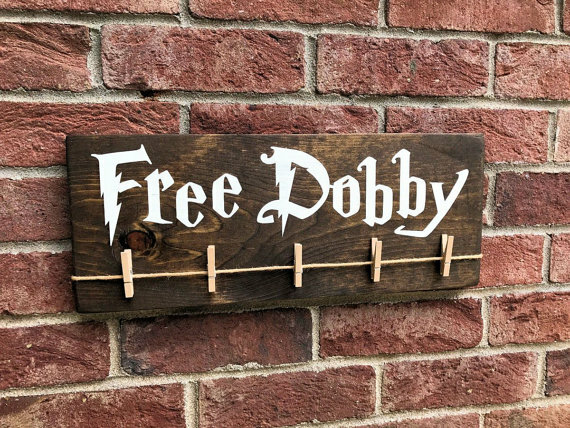 Free Dobby – This is a MUST for every laundry room. Pin single socks up on the board to find their pair later…or just save them for Dobby. 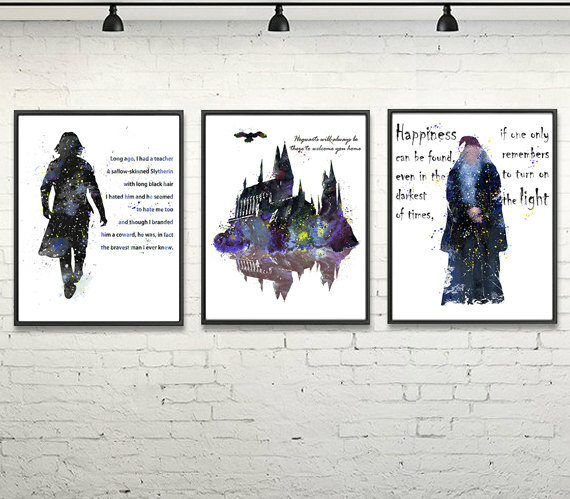 Watercolor prints – These are gorgeous works of art with some favorite quotes from the movie. Dumbledore’s famous happiness quote, Hogwarts will always be home and the words Harry uses to encourage his son Albus Severus about Snape being the bravest man he knew. Grimm cup – The year Sirius Black returns Harry finds what his divination teacher thinks is the Grimm in his cup. It turns out to be a prediction of Sirius’ dog form, but it’s worrisome for awhile when Harry keeps thinking he is getting death omens. 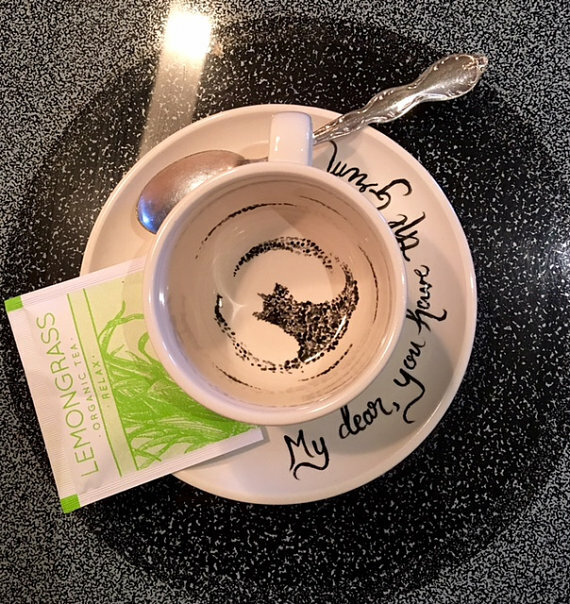 This would be a fun and unique gift for a Harry Potter lover that enjoys tea. 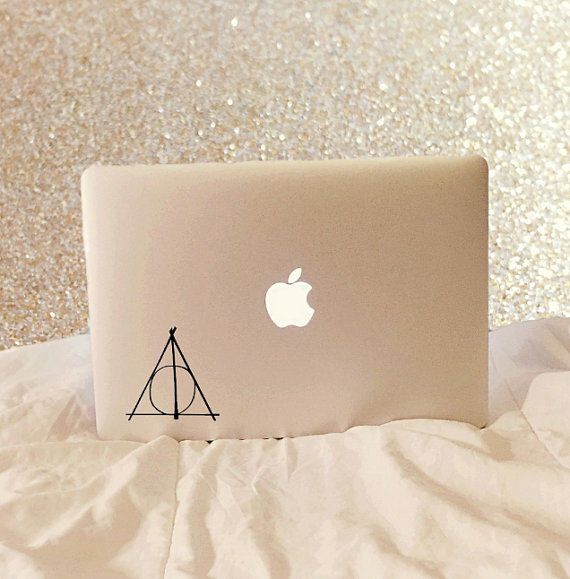 Deathly Hallows laptop decal – This looks hand drawn on the lap top, like the one Dumbledore drew in the book for Hermione! 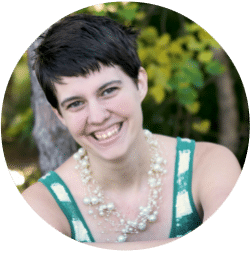 Newt Scewmander gear – Love the chance to get Newt’s scarf and wand from the new movie, Fantastic Beasts! 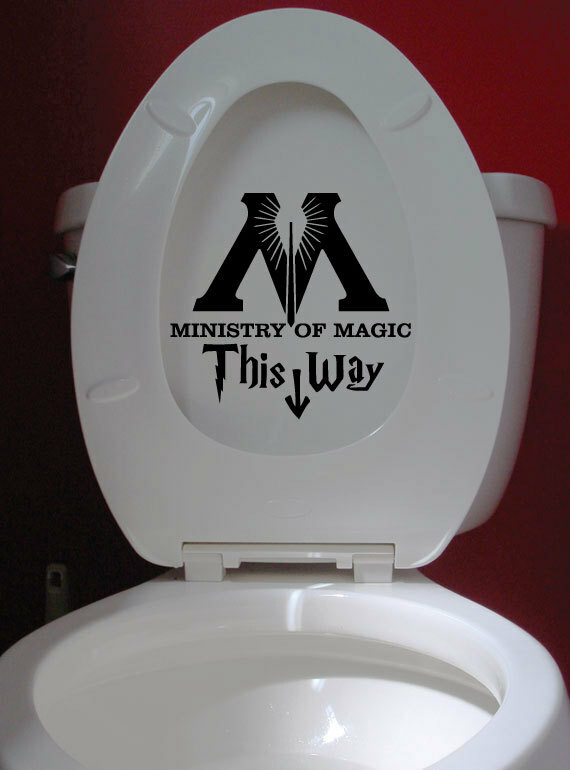 Ministry of Magic directions – This joke will never stop being funny. I just have to convince my husband all our toilets need this. 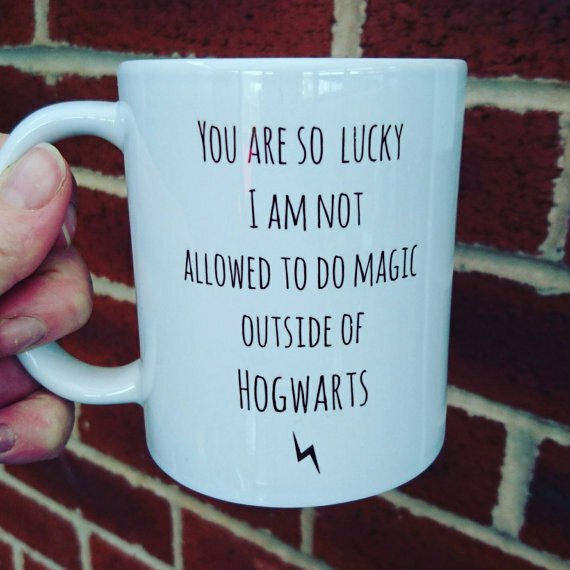 . .
No magic outside of Hogwarts – Coffee mug with just the right about of snark! Don’t mess with any one before coffee! 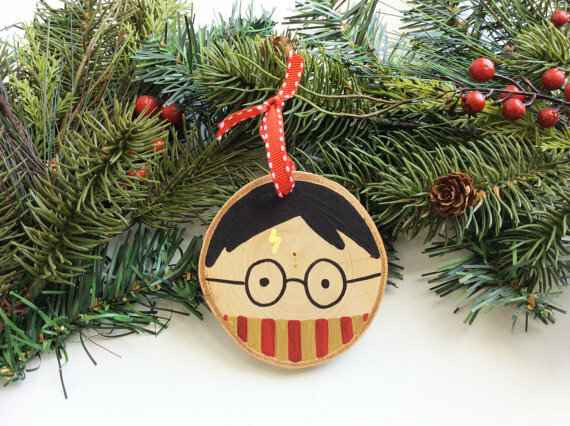 Harry Potter ornament – Painted on a piece of wood, I love that this somehow looks festive and Christmas-y even though it’s only Potter’s face. 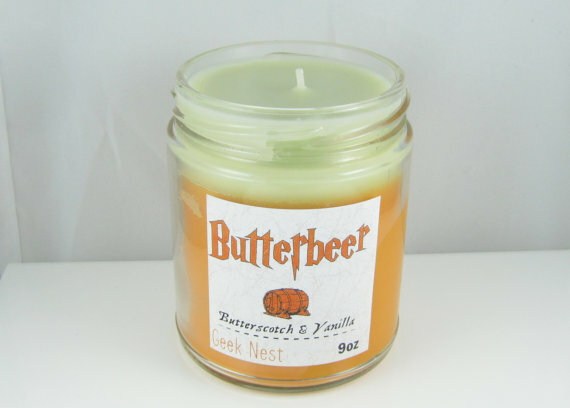 Butterbeer candle – The sweet smell of Madame Rosemerta’s can come to your house with this cute butterbeer candle. 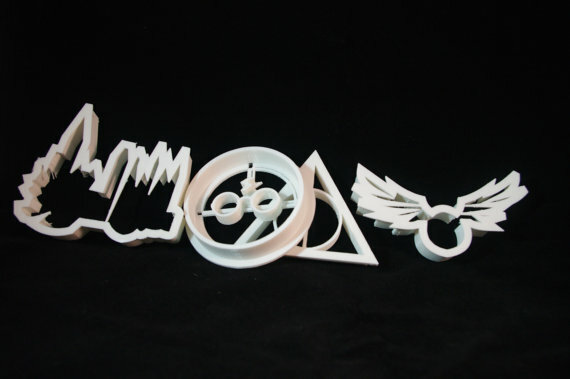 Harry Potter cookie cutters – Make festive cookies for the Christmas feast with these adorable cookie cutters. 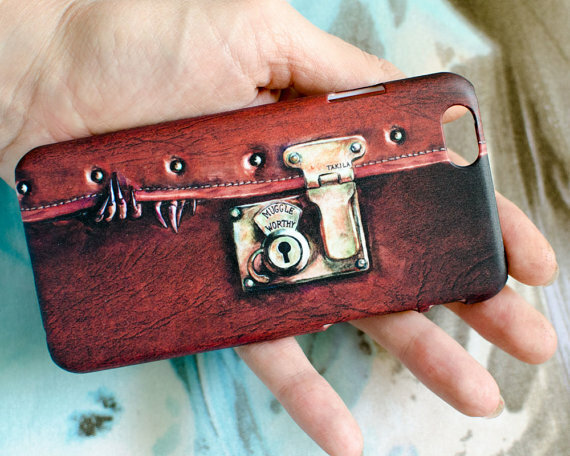 Fantastic Beasts phone case – Newt’s case now becomes a case for your phone. You can even see the little niffler trying to escape it! 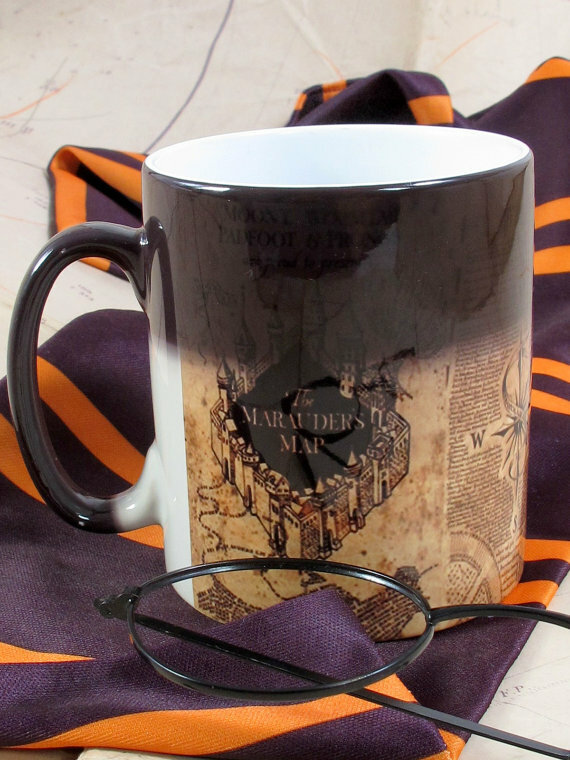 Marauder’s map disappearing mug – The map appears and disappears with change in temperature. Beautiful and thematic. 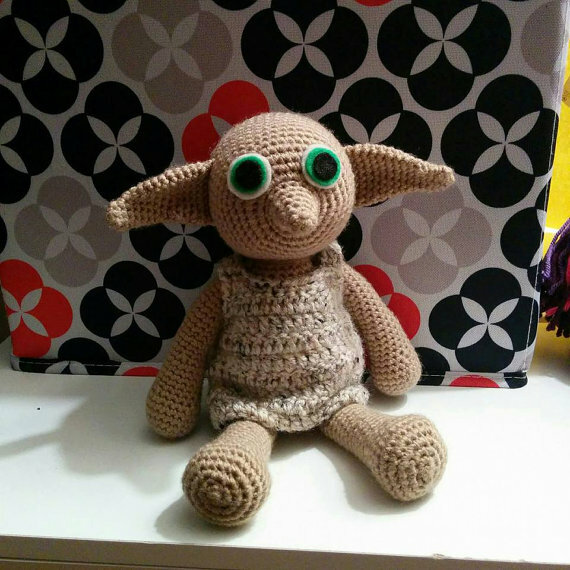 Dobby Doll – This is adorable, if your Harry Potter loving friend who is having a baby, this is the perfect gift. 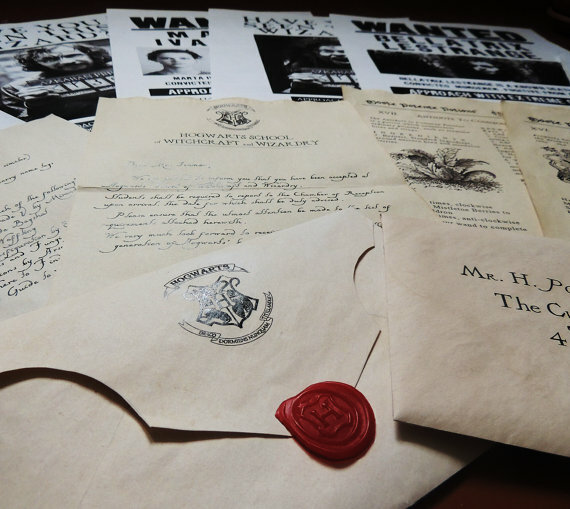 Hogwarts letter – We’ve all been waiting since we were eleven…make some one’s dreams come true with this acceptance letter. 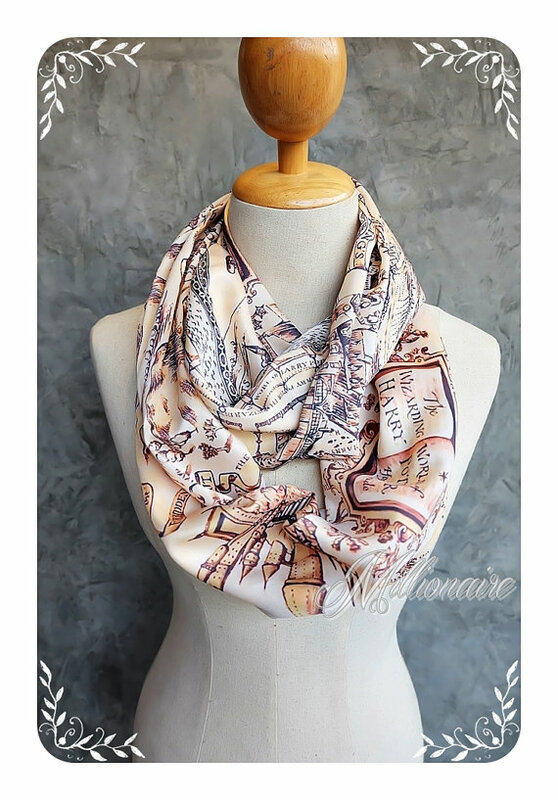 Hogwarts scarf – Gorgeous way to wear your love for Harry Potter every wintery day! 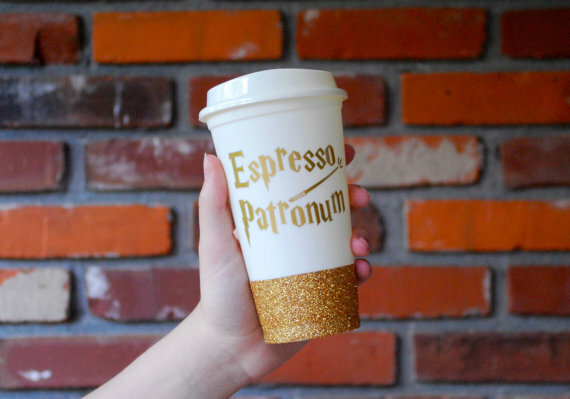 Espresso Patronum – My patronus is definitely coffee, what about you? Also, the glitter on this is everything. Now that you have all these ideas your only problem will be which one to choose for your Harry Potter fan. Hey Buddy!, I found this information for you: "Must-haves for the Harry Potter nerd in your life". Here is the website link: https://www.beautythroughimperfection.com/must-haves-harry-potter-nerd-life/. Thank you.